No need to roast the red peppers for this refreshing chicken and avocado salad—that flavor comes with the dressing! Toss avocados with lemon juice in large salad bowl. 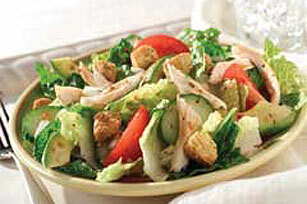 Add lettuce, chicken, tomatoes, cucumbers and onions; mix lightly. Sprinkle with croutons. Serve immediately. Substitute 2 pkg. (6 oz. each) OSCAR MAYER Deli Fresh Grilled Chicken Breast Strips or 2 cups chopped cooked turkey for the shredded cooked chicken. Purchase a rotisserie chicken from the deli counter at your supermarket. Shred enough of the chicken to measure 2 cups. Cover and refrigerate any remaining chicken for another use.